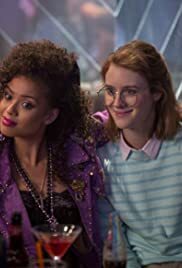 Watch â€œSan Juniperoâ€ (Season 3, Episode 4) from the â€œBlack Mirrorâ€ series on NetflixÂ (Links to an external site.). Use your skills in active viewing, critical thinking, persuasiveÂ argumentation, and writing to analyzeÂ the main theme of science Ã¯Â¬Âction Ã¯Â¬Âlms. In a seaside town in 1987, a shy young woman and an outgoing party girl strike up a powerful bond that seems to defy the laws of space and time. The central theme of a story is the general idea or insight about the human condition expressed by the author. A theme is a universal and meaningful concept that emerges from the charactersâ€™ actions and from the outcomes of conÃ¯Â¬â€šicts described in the story. Themes are often thought of as the life lesson that the author is trying to teach the reader or audience. While more than one theme can be included in a work of Ã¯Â¬Âction, there is usually one central theme that ties together all of the elements of a story. A central theme is generally expressed in one sentence. What is the central theme of this story? The central theme must be clearly stated in the Ã¯Â¬ÂrstÂ sentence of your essay (â€œThe primary theme of the movie is â€¦..â€). The central theme is determined by the power of its comment on technology and its impact on the human condition. WhatÂ comment is being made in this movie about what it is to be human and our relationship withÂ technology?Â In other words, what evidence from the Ã¯Â¬Âlm justiÃ¯Â¬Âes your choice of centralÂ theme?Â Present this evidence immediately after the Ã¯Â¬Ârst sentence. (â€œThis primary theme isÂ evidenced in the Ã¯Â¬Âlm in several ways. For instance, in the opening sceneâ€¦.â€). If youâ€™d like toÂ discuss sub-themes, clearly state them and their relationship to the central theme. What life lessons can be learned from the characters and their use of technologies in thisÂ story? In other words, what is the takeaway message of the Ã¯Â¬Âlm? The life lesson discussionÂ shouldÂ follow logically from the main theme.